Home » 5 Freshest » Haribo Blumen Zauber. More Fuc*i$g Marshmallow? 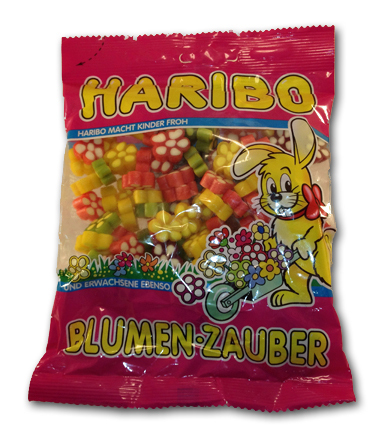 Haribo Blumen Zauber. More Fuc*i$g Marshmallow? A few things are taking over popular culture: zombie apocalypse, bath salts, face eating, vampires, and now marshmallows. Oddest/most ironic part? These don’t even HAVE marshmallow in them! These are presumably Easter candies. They’re comprised of a non-sticky chewy “shell”, with a white creamy marshmallow-invoking fondant-y center. Not good. Chewy and cream gooey. Pretty? Yes. 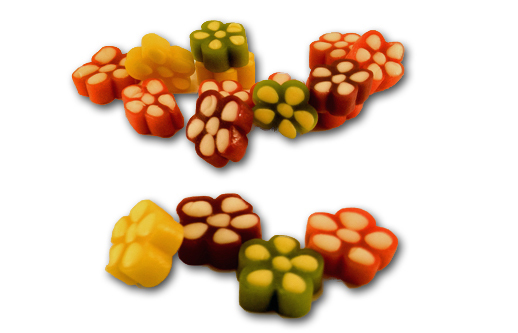 But the taste, which Haribo has released on us before with the heinous “Pico-Balla” variety, is just plain weird. The chewy outside isn’t particularly good-very synthetic, but perhaps on its own, not horrible. When mixed with this marshmallow-like inside, it’s gross. Why do we need this? It doesn’t make it better. At all. In fact, this is the ONLY bag of Haribo I’ve ever taken into work and had sit, opened and ignored for weeks. No one ate more than one. That should tell you all you need to know. Haribo can keep repackaging this mis-fire combination of ingredients if they like, but I won’t be purchasing them. What if they were actually embedded in a marshmallow?